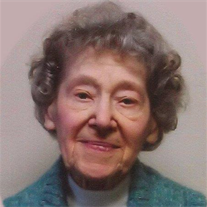 Beloved aunt, great-aunt and friend passed away Saturday, October 21, 2017 at Edgewood Assisted Living. Age 93 years. The daughter of the late Frank and Julia (Lis) Nicewicz, Anne was born December 16, 1923 in Saginaw, Michigan. Her proudest moment was leaving Michigan to work at the U.S. Pentagon in Washington, D.C., during WW II. While there, she met and worked with many military and civilian personnel from all over the country and treasured her friendships. Anne was a member of the Catholic Daughters of America and regularly visited veterans at the Walter Reed Hospital. Anne was a member of Holy Spirit Catholic Church and the League of Catholic Women. Anne enjoyed traveling and her adventures took her far including Europe and the Vatican. She loved the theatre, music and reading. Anne is survived by several nieces and nephews. Anne was preceded in death by four sisters and two brothers, Mary Witkorowski, Dorothy, Sophie, Cecelia, Stanley and Joseph Nicewicz. A special thank you to Anne’s niece, Sharen, and nephew, Tom, for their loving care, and to Bobbie Metiva for her regular visits. Anne’s family extends their gratitude and appreciation to Edgewood Assisted Living and Covenant Hospice for their loving and compassionate care. Funeral Liturgy will take place 11:00 a.m. Thursday, October 26, 2017 at Holy Spirit Catholic Church, 1035 N. River Road in Saginaw. Anne’s nephew, Rev. Fr. Stephen Fillion, will officiate with burial in Mt. Olivet Cemetery. Friend may call at Holy Spirit Catholic Church where the family will be present on Thursday from 10:00 a.m. until time of Mass. In lieu of flowers, please take a special aunt, mother or grandmother to lunch.